Thermowave Analyzer(TA) and Thermal Microscope(TM) help you to analyze thermal resistance of your engineering materials. This site is run by Bethel Co., Ltd. of Japan. We would like to introduce the testing results for High Thermal Conductive Plastic today. High Thermal Conductive Plastic(HTCP) is highly interested materials to replace metals. For example, they are used to replace metal housing for LED bulbs and heatsink. The testing was performed with the corporation with UNITIKA. We made samples with the size 30 x 30 x 1 [mm]. Since we have tools and machines, we made the molding and did the plastic injection by ourselves. Fig.1 The series of plastic injection for HTCP. As you can see how the plastic flows and make the shape. Using our Thermowave Analyzer(TA), we measured the thermal diffusivity of the samples. We made samples with 3 different grades: 5W, 20W, and 50W. The following pictures are the results for each samples. In these pictures, red and blue represent higher and low thermal conductivity respectively. As you noticed, 20W sample was　made uniformly. On the other hand, 50W sample was not as uniform as 20W. We believe this is due to the fillers UNITIKA put in these samples. The filler changes how the plastics flow inside the molding. One thing we should notice is that although the appearance of the HTCP samples are good, thermal property of the samples are not so uniform. In some applications, the non-uniformity of the thermal property plays a quite big role. My colleague's families were hit by Tsunami but found alive! His relatives were hit by Tsunami on 311 and their houses were washed away with the water. For more than 3 weeks, he could not contact any of them, but as he went searching for them, he found them at the shelter. Non of the family members were dead. Thank you for your prayers! Bethel Co. Ltd. sincerely hopes for safety and swift recovery of the people and areas in Japan affected by the disaster of The Great East Japan Earthquake. We were also influenced by the quake. However, we were able to restart our business three days later. No one was hurt or no machines or factory facilities were damaged by the quake. Do you know Thermal Conductivity sheet for CPU? Thank you for reading my blog all the time. Since I opened this blog, many people emailed me and asked, "don't you have more applications which you can share with us?" So I would like to measure Thermal Conductivity Sheet for cooling CPU. The sheet is made of mixing fillers like Alumina in Silicon rubber. Not only raise the thermal conductivity, but it also gives the flexibility and adherence. This enables to reduce the thermal resistance between CPU and heat sink or other surface touching CPU. Our Thermowave Analyzer is useful for the Thermal Conductivity sheet for CPU. I would like to share the measurement result later. So please keep in touch with us. How to measure the coating of carbide tool? The carbide tool is made of mixing Cobalt with Tungsten Carbide(WC). To improve the quality, it will be coated with either Titanium Nitride(TiN), Titanium Carbon(TiC), Aluminum Nitride(AlN), or Diamond Like Carbon(DLC). Normally, measuring the thermal property of these coatings were very difficult. However, they could be evaluated with our Thermal Microscope(TM3). The above picture is an example of evaluating the coating of a Carbide tool. We scan the coating region and substrate region in a line. 1. TM3 could evaluate with a spatial resolution of 3um. 2. 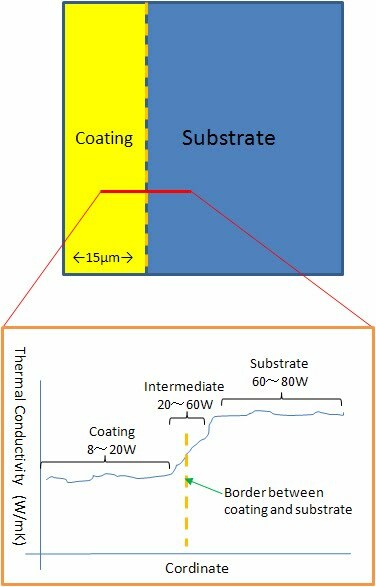 The thermal conductivity of coating on a substrate could be evaluated. 3. TM3 could evaluate the sample from out-of-plane orientation as well. 4. Tm3 could evaluate the thermal conductivity of thin films(100nm - ). 1. Measure the thermal conductivity of coatings. 2. Evaluate the intermediate region between coating and substrate. Thermowave Analyzer for SMT boards? The new application for Thermowave Analyzer (TA) was added. TA could be used to evaluate thermal design of SMT boards. Gallium Nitride (GaN) for blue LEDs? Do you know how Gallium Nitride (GaN) plays a big role in blue LED lightings? Gallium Nitrid (GaN) is not only used for blue LED, but, as SiC, it is widely used for next generation wide band gap semiconductor devices. Unlike Si or SiC, it cannot be created as a wafer. Instead it is epitaxial grown, as a thin film, on a Si or Sapphire substrate. Therefore, if you want to evaluate the thermal conductivity of GaN, you must evaluate as thin film. Engineers are researching high purity GaN crystals these days also. But it could be created in a small amount only. Thermal Microscope (TM) could evaluate GaN in either forms. We cannot share the actual results from our clients in details, but as we measured GaN, the values were very similar to the literature values. TM could evaluate the samples with high spatial resolutions. It could also evaluate the thin film samples as well. If you are interested, please take a look at Thermal Microscope (TM). I received master's degree in applied physics from Columbia University. After I came back to Japan, I started developing systems which measure thermophysical properties of materials. Find me on Facebook. Copyright © Thermal Testing Service. All rights reserved.